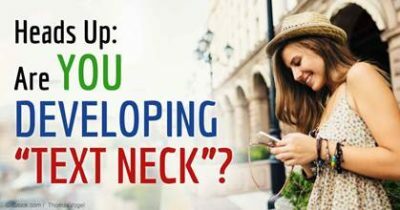 Are you developing “Text Neck”? Do You Have Text Neck? Most likely you have heard the term “text neck” recently. Do you know what it means or how detrimental it can actually be? Do you experience neck or back pain after you’ve used your handheld technology for too long? Do you notice your children constantly looking down at a smartphone, e-reader or handheld video game? If you answered yes to any of these questions…keep reading!!! What is “text neck” exactly? Text neck is a term used to describe the anterior or forward head carriage adopted when using (or overusing) a handheld or wireless device. These devices can include anything from a smartphone, tablet, video game, e-reader, laptop…the list goes on and on. That forward head carriage is caused by looking down at these devices for extended periods of time. 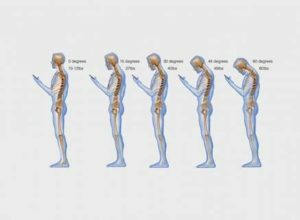 Symptoms of text neck can include neck pain, upper back pain, headaches, shoulder pain and even significant postural changes such as decreased curvature of the neck. How, you ask? Excessive neck flexion (forward bending) allows gravity to alter its pull on the neck. Your head, on average, weighs between 10 and 12 pounds. When your neck is bent forward, gravity adds to that weight putting excess pressure on the muscles of the neck and upper back causing overstretching and tension. The development of text neck is prevalent in adolescents and young adults because they tend to be more tech savvy and thus are on their handheld devices much more than mature adults. 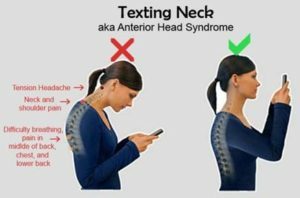 Text neck may lead to the early onset of arthritis in the joints of the spine and has also been shown in recent medical research to decrease lung capacity. Arthritis in the joints of the neck can be caused by the constant overstretching of the ligaments which, after a certain point, will no longer support the joints in the spine properly, thus changing the biomechanics of the spine. Decreased lung capacity is attributed to the rounded shoulders that accompany forward head posture. When the shoulders round forward and the upper and mid back hunch over, the ribs are unable to expand properly, thus limiting the functionality and efficiency of the lungs. How is text neck treated? Well, prevention is always the easiest way! Educating your family, and even yourself, on proper posture can go a long way in helping to prevent text neck. 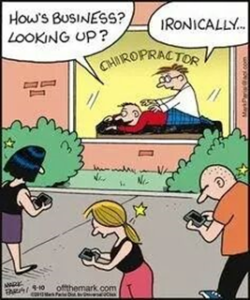 If it is a little too late for prevention, visit a chiropractor trained in spinal curvature restoration for treatment to help reduce the effects of text neck. The Bozeman Chiropractors near you at Pro Chiropractic are well equipped to help not only relieve symptoms associated with this up and coming problem, but we can also design a unique program to rehabilitate the natural curvature of your cervical spine utilizing Chiropractic Biophysics. Consistent spinal adjustments can help maintain or restore proper biomechanics to the neck and upper back to ensure that the joints remain mobile. Soft tissue mobilization will reduce muscle tension and pain in the neck and upper back. And using therapy devices including extension-compression traction chairs, cervical resistance bands, and home orthopedic devices consistently may lead to measurable correction of the altered curvature in the spine and could reestablish correct posture and significantly decrease the symptoms over a longer period of time.